Nigeria's second day of voting continued yesterday in a presidential election seen as too close to call, as the death toll from vote-related violence mounted in Africa's largest democracy. The electoral commission said voting was generally peaceful despite one of its workers being killed by a stray bullet. At least 39 people have died in extremist attacks. 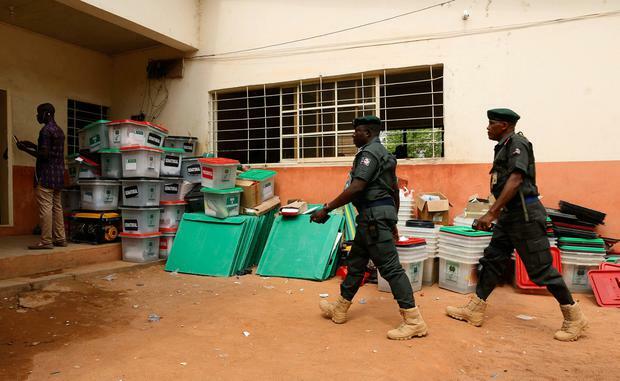 Electoral chairman Mahmood Yakubu did not give an overall death toll, saying he was focused on workers, who faced "intimidation, abduction, hostage-taking and violence". In one case, he made an urgent phone call to secure the release of workers and even police taken hostage in Rivers state in the south, he said. All were unharmed. "Nigerians have demonstrated extraordinary resilience and abiding faith in the electoral process," Mr Yakubu said. More than 72 million people were eligible to vote. The election was held a week late after the electoral commission cited several logistical challenges, including bad weather. President Muhammadu Buhari, a former military ruler who unseated the incumbent in the 2015 election, is seeking a second term against more than 70 candidates. His main rival is Atiku Abubakar, a former vice president and billionaire businessman.